Yup! 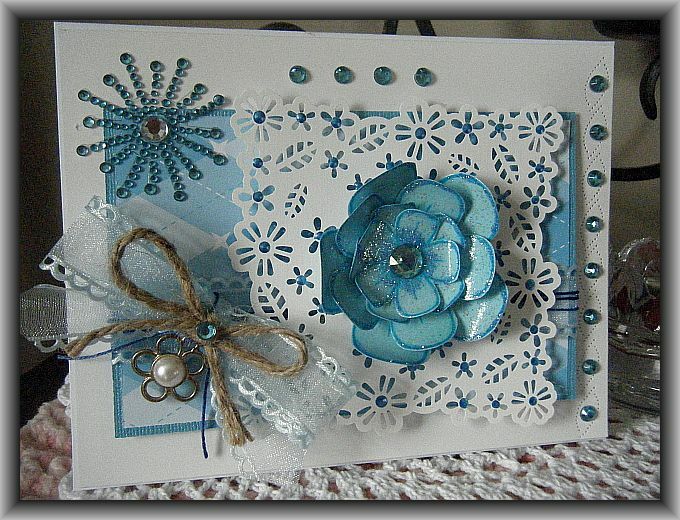 the people at Stampin B’s have asked for bling in this weeks challenge! This is fun stuff but I think all the posting is as much work as making the cards! LOL! 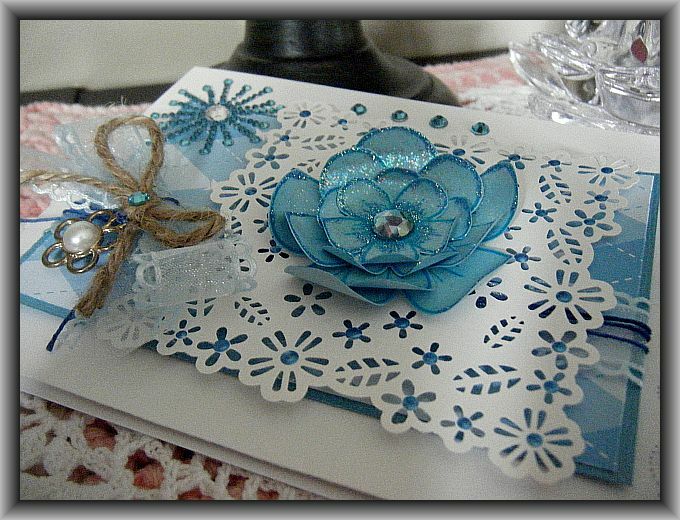 For this card I used the Martha Stewart Wild Flowers Punch Around the Page punch set. 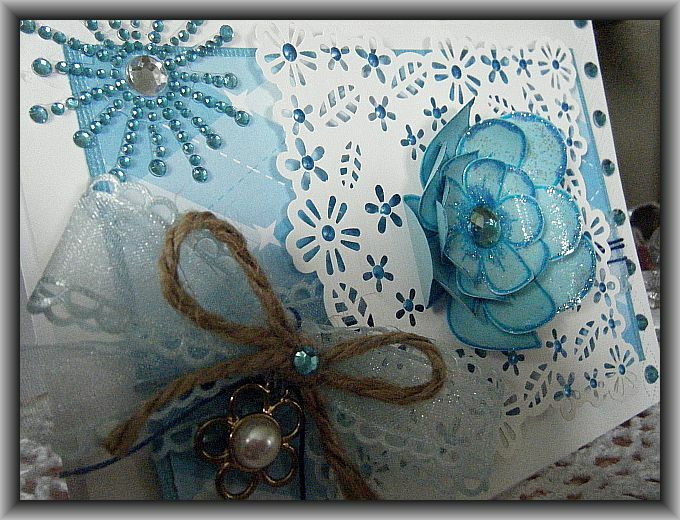 I put a little dot of Ocean Blue Liquid Pearls in the center of each flower in the punch. For the main flower I used Heartfelt Creations Posy Patch Flowers PreCut Set, this set comes with seven different size posy’s and for this flower I used 4, cut them out, coated them with 2 layers of sparkle modge podge and then cut them out by hand. I love this flower! I added a shiny blue gem to the center of the flower and I added some Waterfall Stickles to the edges. Here is a closer look at the flower from a different angle…. Also I used my Ecstasy Paper Piercing kit to do the piercing design on the side… here’s a closer look…. The real fun was blinging it up! I added the twine on top of the bow because I really wanted to enter this card in the Friday Free 4 All Challenge on Splitcoast. I made this card for three different challenge entry’s. As this is a Sassy Chery’s Show me Challenge http://sassycheryls.blogspot.com/2011/07/show-me-33.html I felt it was fitting since this is a pre colored image from Sassy Cheryl’s. The next challenge is from Tuesday Throwdown http://tuesdaythrowdown.blogspot.com/2011/07/tuesday-throwdown-57.html and their theme is Fun in the Sun. Also I wanted to enter into the Cute Card Thursday challenge http://cutecardthursday.blogspot.com/2011/07/challenge-173-going-round-in-circles.html Their theme is Going Round in Circles. 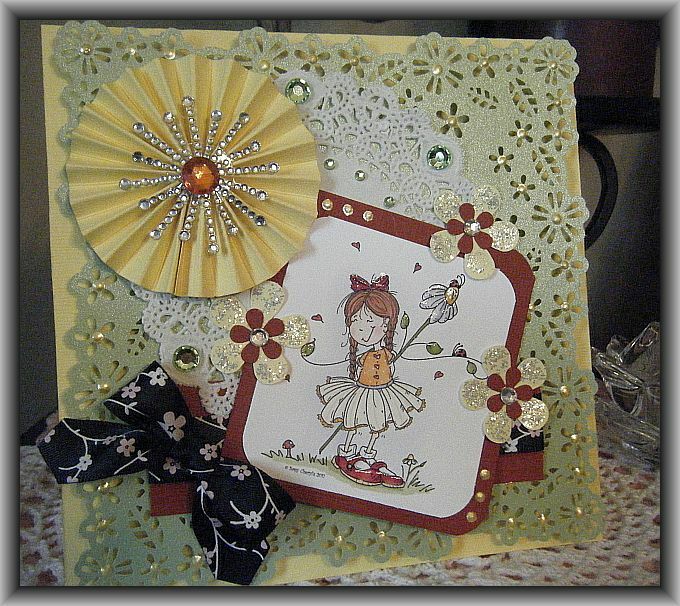 I used my Martha Stewart scoring board to make the fan rosette and the green background mat was created with the Wild Flowers Martha Stewart Punch around the Page punch set. 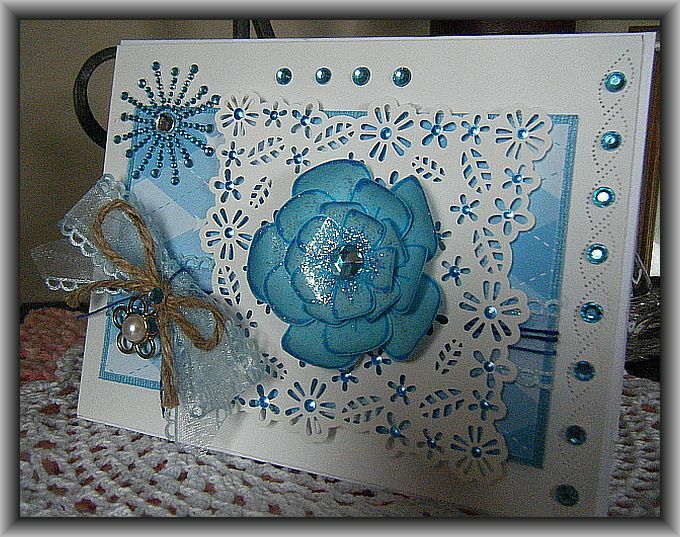 I added liquid pearl dots to all the centers of the flowers and some stickles to the punched out flowers to give them some shine. Hope you like it! Sorry the picture isn’t fantastic, it is a dark and dreary day here so it was difficult to get a good picture I’m afraid.